The beloved Game of Thrones star best known for his role as The Mountain married his long-term girlfriend in what is assumed to be his native Iceland. It seems the actor who plays The Mountain has a much softer side than his fictional alter ego, if the wedding pictures are anything to go by. These are enough to make all memories of the moment his character crushed a man’s skull with his bare hands disappear quicker than you can say ‘I do’. Hafþór Júlíus Björnsson, his real name, in case you missed it, has now married his long-term girlfriend, Kelsey Morgan Henson. The actor, who has starred in HBO‘s Game of Thrones as Gregor Clegane since Season 4 announced the marriage on Instagram. It is with great pleasure that I now get to call Kelsey Morgan Henson my wife! The wedding shoot seems to have taken place in the landscape of his home country of Iceland, and the photographer who had the honours is Icelandic also, leading fans to guess they were indeed wed there. She’s only 5″2, compared to her new husband’s 6″9, and the beautiful wedding photographs go to show just how much size doesn’t matter when it comes to love – or lifting. Björnsson’s new wife – who is a 28-year-old Canadian – also shared the happy news on her Instagram. Looking forward to pulling this big guy around for the rest of my life. @thorbjornsson I love you now and forever and promise to stand by your side through all that life throws at us. I love you baby! The pair met back in 2017 in a bar when Henson asked for a picture with The Mountain – and from then on they’ve never looked back. The couple love training together at the aptly-named Thor’s Gym. According to a doting and proud Björnsson, Kelsey can lift more than double her body weight. Double congratulations are in order, actually, as The Mountain recently realised another of his life’s greatest dreams, winning the World’s Strongest Man contest and enjoyed his best season to date as a strongman. 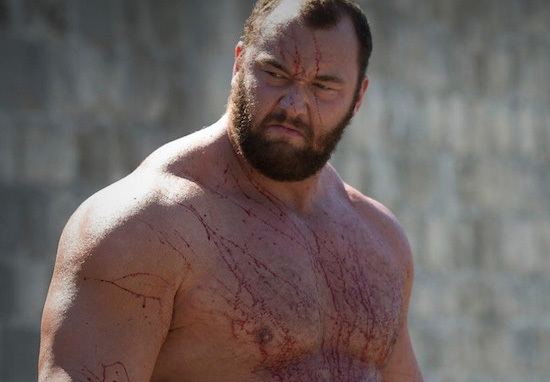 Björnsson recently revealed his daily workout routine, as well as his diet plan, and it’s absolutely brutal – and rightly so as we prepare for the final series of Game of Thrones, which will be hitting screens in 2019. They’re not enjoying the only Game of Thrones wedding – besides the red one which must not be mentioned – fans have been able to freak out over in recent times. Rose Leslie and Kit Harington tied the knot after meeting on set, playing the characters Jon Snow and the wildling, Ygritte, earlier this year. Congratulations to the newest happy couple!